Jordan is a country that is bulging at the seams with history — and all of it within easy driving distance from Amman. No matter where we ventured over the past week, we drove through or past places where the dust of the centuries continues to stir around the stories of the past. From the ancient columns of the Amman Citadel to the heights of Mount Nebo and from the site of Jesus’ baptism at the muddy Jordan River to the shores of the Dead Sea, it’s impossible to escape the past while in Jordan. In many ways, scenes of the present can easily stir your imagination about what life must have been like in the past. You can catch glimpses of the centuries in the young boy herding his sheep and goats beside modern paved roads and in vistas of Bedouin tents clustered on barren and windswept plains. It seems that no matter where you look, history is alive and well in Jordan. 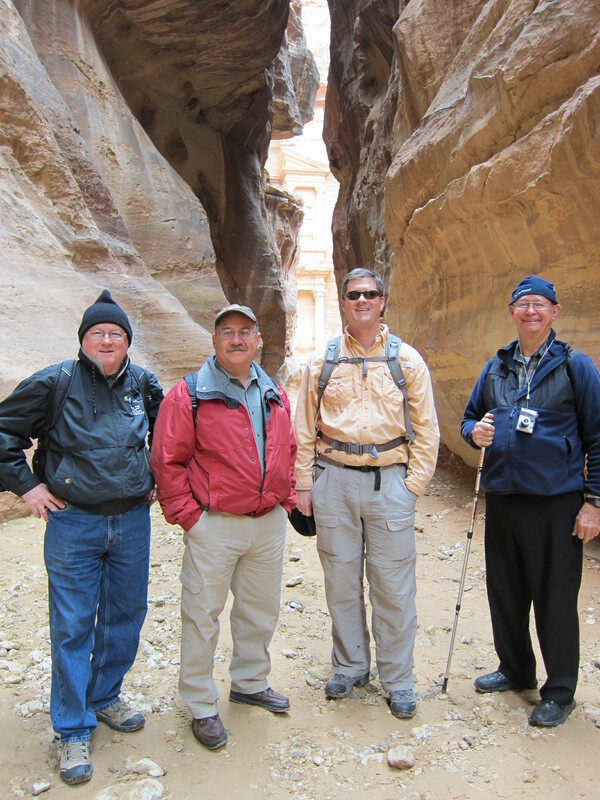 Yesterday, we set aside time to visit Petra, Jordan’s most valuable historic treasure and greatest attraction. Hidden away in the southwestern corner of the country, Petra was once a thriving trading center. 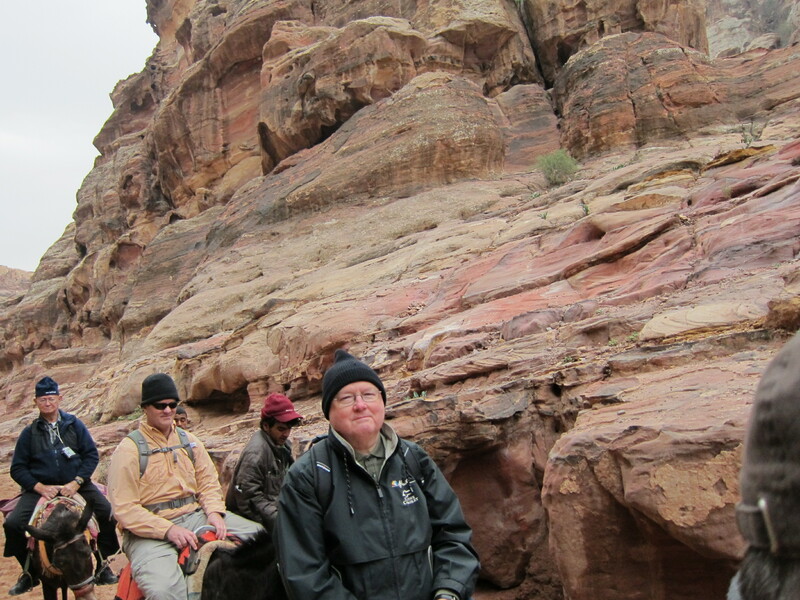 With massive buildings carved into sheer sandstone cliffs by the Nabataeans, an industrious Arab civilization that settled in this area more than 2000 years ago, Petra continues to defy the efforts of the elements to erase its place in Jordan’s history. 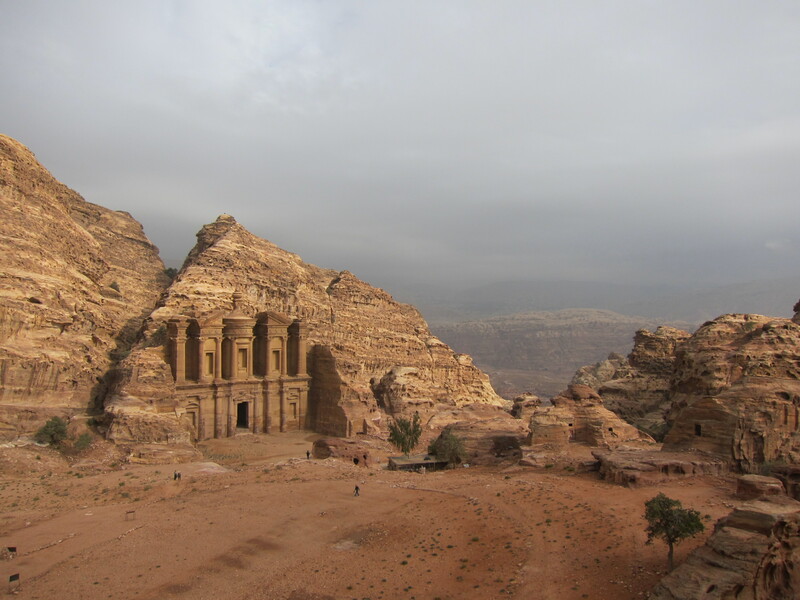 At its height, Petra became an important junction for the silk and spice trade. Its strategic location made it a junction for the trade routes that linked China, India, and southern Arabia with Egypt, Syria, Greece, and Rome. It’s the kind of place where your footprints make only the slightest of impressions in the dust beneath architectural wonders that have inspired countless people through the centuries — a place that still takes your breath away. Perhaps the hardest to reach place in Petra is El-Deir or The Monastery, Petra’s second most famous attraction after The Treasury building that first greets visitors to the site. To reach El-Deir, visitors must climb or ride a donkey up a flight of some nine-hundred steps cut into the rock. But, whichever way you choose, it’s worth the effort to visit this magnificent site. El-Deir likely began as a temple and is believed to have been used as a church and a monastery by later societies. As I stood before the magnificent El-Deir, I could not help but wonder about those who either worshiped there or who retreated to this site in obedience to monastic vows. I also wondered about all of the people who lived their daily lives in the regions far below this secluded mountaintop. While retreats can be good for refreshing the soul, retreating and living in isolation from others is not what God designed us for. We can be inspired on the mountaintop but we should always live out what we believe in the valley — in the places where ordinary people live their lives. As we head home, I can’t stop thinking about all of the people we have served this past week — Syrian refugees who have suffered great loss and who find themselves walking through the darkest of valleys. We made many meaningful connections because we intentionally walked slowly among these suffering people. We are all returning home a little weary but filled with gratitude for what we experienced among the Syrian refugees we served, certainly much more than the stories that I have had time to blog about. It was also good to visit El-Deir but even better to return to the valley below. Great post! 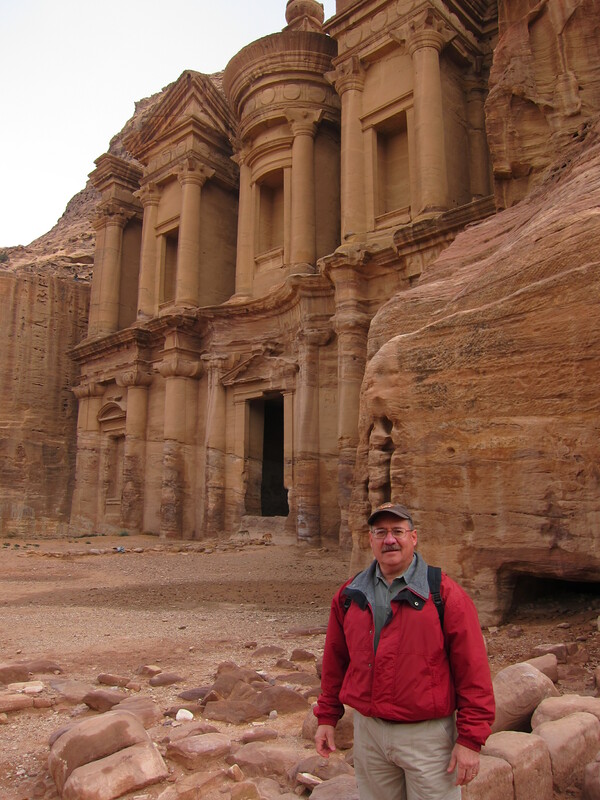 Thanks for sharing; I’ve always wanted to go to Jordan- especially to Petra! Thanks, Ashley. Petra is magnificent. I hope your travels will take you there soon.